She is one of the most important and influential sculptors of our time. Yet, although she had a solo show at Chicago’s Renaissance Society, in 1992, she has never had a large-scale retrospective in an American museum. This exhibition of work by the Berlin-based German artist, organized jointly by MCA Chicago, the Museum of Modern Art in New York, and the Dallas Museum of Art, seeks to correct that oversight, introducing American audiences to the breadth of Genzken’s 30-plus-year career. Her early work was initially in dialogue with minimalism but quickly spiraled out into ideas about hybridity and what has come to be known as the “post-medium” condition, a blurring of traditional distinctions between media such as painting, sculpture, and photography. Which explores[RH1] how photography is similar to the act of seeing. The title of the exhibition is adapted from the 1980 photography handbook How to Control and Use Photographic Lighting, which demonstrates how different lighting drastically affects how details appear in an image. Illustrating this section of the manual is a still life of three objects: a cube, a sphere, and a mannequin’s head. 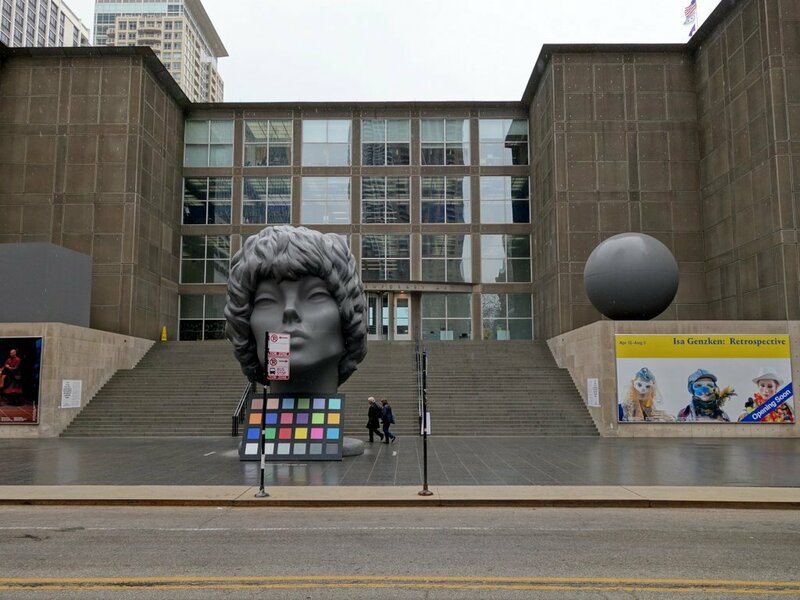 For her iteration of the MCA Chicago Plaza Project, Ross-Ho re-creates this trio at a monolithic scale with faithful allegiance to the original image. Completing the installation is a large-scale rendering of a color calibration card—the color grid that is used to maintain accuracy in the printing or post-production of color photography because it remains consistent in various lighting conditions. By including this card—which is usually discarded or cropped out of finished photographs—Ross Ho presents an image that is self-consciously “contaminated,” as the color calibration card disrupts the composition. At the same time, its inclusion points to it as an artifact of a bygone era in which “accuracy” or “truth” in photography was a given. The city of Chicago was important to Calder. In 1935, the Renaissance Society and the Arts Club of Chicago hosted one of his early solo exhibitions in the United States. The Horwich family amassed a significant Calder collection, befriending the artist and ultimately acquiring more than two dozen of his artworks. In 1974, as part of the inaugural ceremonies for Flamingo, then-Mayor Richard J. Daley declared a “Calder Day,” and Calder was carried to the sculpture’s dedication by a circus-themed parade on State Street. The 1960s were important years for artists and friends Andy Warhol (American, 1928–1987) and Marisol (Marisol Escobar, American, b. France, 1930), and marked a formative period in the development of their individual careers. Warhol began using his celebrated silk screen techniques to produce serial paintings, often based on mass media images. Marisol made the first of many portraits and developed her signature style, wooden sculptures with flat painted surfaces and additional elements such as everyday objects or plaster castings. Both were prominent figures in New York City’s lively art scene during this time.